Portable hammocks fold up for easy transport and unfold for, hopefully, a comfortable and hassle-free rest without having to be strung up to trees (Source). 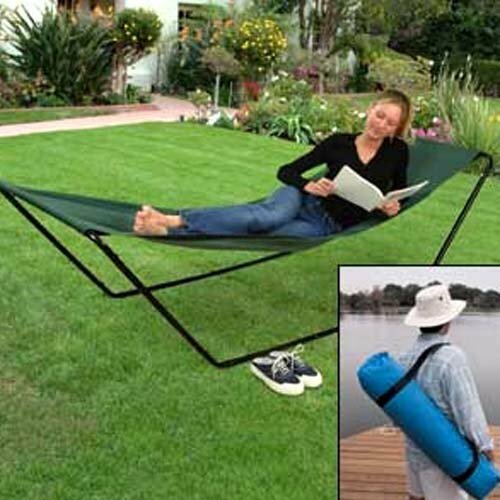 They are similar to hammocks with stands, but are portable, with folding frames. There is spirited debate online regarding which of these mobile, folding hammocks are actually worth the money. Many buyers we interviewed report that their folding hammocks were structurally weak and poorly designed. The most egregious example being the Jumbl travel hammock, which multiple users report falling through! When it comes to selecting a foldable hammock, there are some important buying criteria to pay attention to. How easy is it to fold up? Does it come with extra amenities (i.e., cup holders, mosquito netting, carrying case, pillows, storage areas, canopies)? How much does it weigh (you want something lightweight if you're backpacking or hauling it to the beach)? The best option, as far as we've been able to determine, is the Fold and Go Travel Hammock​. This foldable hammock is a comfortable, sturdy, collapsible option that is reasonably priced. It employs a handy mesh storage cradle beneath the hammock. It ships with a carrying bag and has a robust weight capacity of 225 lbs. Buyers we spoke to told us that it didn't require any assembly, and its frame easily unfolds and folds back up. The frame is sturdily built from welded metal finished with a glossy paint. Users transport it to the beach, camping grounds, or install it in their backyards. 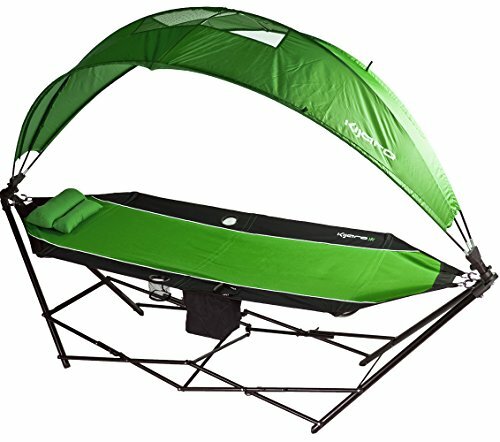 This outdoor hammock bed offered by Guide Gear is comfortable, well-supported and easy to set up. Users love the price and that it folds quickly, but some do note that the stitching is not durable. This folding hammock stand measures 6” x 12” x 12” and it’s made of cotton jersey. It has an ultra- strong 8’-long steel frame, a mesh fabric bottom for improved air circulation and a weight capacity of 225 lbs. The hammock weighs 26.45 lbs and it comes with a backpack-style carrying bag. Overall, this is an excellent choice if you are looking for a cheap hanging bed. A user comments that this foldable beach hammock swings just like a real one and that it feels sturdy and well-made. The reviewer also adds that the hammock is light and you can take it down for a couple of minutes. Another happy buyer mentions that he is over 6 feet tall and he uses this hammock stand bed without worrying about falling. He would recommend it to anyone looking for an affordable indoor or outdoor (beach) hammock. A satisfied purchaser shares that he weight 240 lbs and the steel frame holds him without sagging. However, some customers have complained that this hammock bed is too unreliable and unstable and that it could tear unexpectedly. 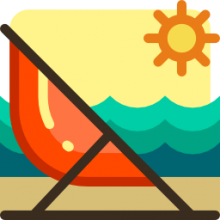 Some users also complain that the hammock lasted only a couple of days and that it’s too uncomfortable to use. 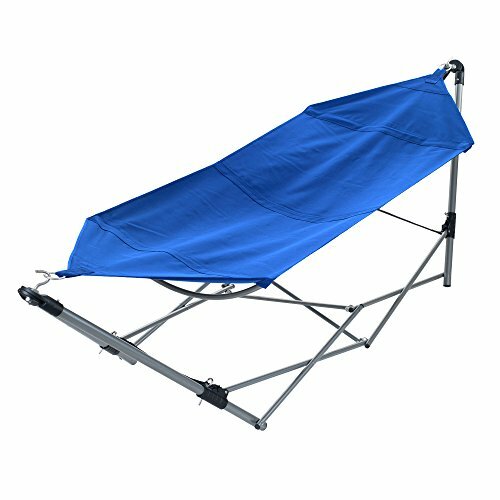 This blue portable hammock bed offered by Stalwart is convenient, foldable and perfect if you are going camping. Users love that it’s easy to set it up, but some do note that it’s poorly made. This portable hammock bed measures 97.5″ x 31.5″ x 32.25″ when it’s flat and 7.5″ x 7.5″ x 44.5″ when it’s folded. It’s made of sturdy, comfortable canvas with an aluminum frame and you can assemble it quickly in three steps. The weight limit is 250 pounds, and the package also includes a carrying bag so that you can take it with you wherever you go. It’s also available in red and black. In general, users have a mixed opinion of the Stalwart blue hammock frame, and they warn that it doesn’t swing very well. A buyer comments that he is 5feet tall and he fits comfortably in the hammock. The reviewer also adds that setting up and taking down the hammock frame takes only a couple of minutes. Another user shares that the carrying bag is very useful and that she can easily fold the hammock inside. She highly recommends it to anyone looking for a portable hammock bed. On the other hand, some customers have complained that they don’t feel safe when they lay in the hanging bed. They say that it’s too unstable and they are afraid it would flip over. Some users also note that the stitching is poor and that you shouldn’t expect the Stalwart hammock frame to last very long. If you are searching for an outdoor hammock with a canopy, you might want to take a look at this hanging bed offered by Kijaro. Users love the extra features, but some do note that the canopy poles break quickly. The all in one hammock measures 10 x 10 x 42 inches with a weight of 33 pounds and it’s made of 100 % polyester. It has an 180-degree rotating canopy that detaches, plus a cooler that holds up to 6 drinks, two mesh cup holders, a magazine holder and a backpack carrying bag with wheels. Overall, buyers are pleased with the stability, durability, and size of the Kijaro traveling hammock. A user shares that this swinging bed is big enough for two people and that it’s sturdy, well-made and easy to set up. The reviewer also adds that he is six ft tall and he feels cozy when he is lying in it. Another happy customer mentions that the shoulder straps of the carrying bag are padded and that he had no problems to put the hammock in his backyard. He would recommend it to anyone who wants an outdoor hammock bed. A purchaser states that she has this canopy bed for a year and it’s still in good condition. However, some customers have complained that this hanging bed is heavier than they anticipated and that it doesn’t swing back and forth. Some users also note that the quality of the material is poor and that it’s hard to set it up and fold it down. This foldable hammock bed with a stand offered by Jumbl is light, comfortable and easy to transport. 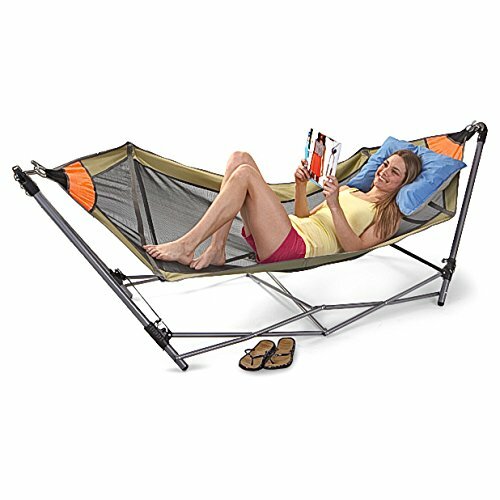 Users love the quick assembly process, but some do note that it doesn’t swing as a traditional hammock. This folding hammock bed measures 33 x 28 x 85 inches and it has a sturdy steel frame, and PVD backed polyester sling which is soft and water resistant. You can store it in its carrying case with shoulder harness and take it to the beach, the park or your backyard. The weight capacity is 220 lbs. In general, users have a mixed opinion regarding this portable hanging hammock. A satisfied buyer shares this hammock bed is huge and two people can fit inside easily. The reviewer also mentions that it’s perfect for lounging outside in the sun. Another purchaser shares that this is the best camping hammock and that it takes a couple of minutes to put it together. A user also adds that it’s easy to get in and out of the hammock and he feels safe and comfortable in it. However, some customers have complained that this hammock bed is dangerous to use because the fabric tears quickly and you can fall through it. Some also note that this hanging bed is it’s heavier than they anticipated and that it’s difficult to stretch the hammock and snap the bars. If you want a touch of the tropical in your backyard, you might take a look at this portable hammock bed offered by Fold and Go. Users love the comfortable surface, but some do note that it doesn’t look like the provided picture. This folding travel hammock measures 6.9” x 12” x 54” and it has an improved steel frame for durability, a mesh cradle for storing blankets or pillow, a weight of 29.4 pounds, and a capacity of 225 lbs. The hammock has a striped pattern, but be aware that the colors may vary. The package also includes a matching carrying bag. As a whole, users are extremely satisfied with the design and construction of this travel hammock. A buyer comments that this swinging bed arrived quickly and that she didn’t have any problems to set it up. The reviewer also states that it’s a perfect gift for Father’s day. A happy user shares that this is ideal for afternoon naps and he highly recommends it. Another customer adds that this hammock folds as quickly as a folding chair and that it’s made of high-quality material that won’t tear. He also states that the frame is solid and doesn’t bend. However, one customer has complained that the mesh is loose and that it’s hard to fold it back in the carrying bag. The user also states that the bag arrived with a hole in it. What Are Hammock Buyers Saying? The first portable folding hammock with a carry bag we looked at was the Guide Gear collapsing hammock. This option is roomy- spacious for relaxing and made to be quickly set up, especially in the backyard. Air easily circulates through the mesh fabric for a cooling sensation. It has a strong frame made of steel and is very roomy, considering that it is 8 feet long. This hammock is made for easy travel with the backpack-style shoulder straps on the carry bag and is moderately heavy, weighing 26 pounds. According to one consumer who bought this collapsible Guide Gear hammock, he didn’t have the place for a traditional rope or ENO hammock so he bought this one to unfold as needed in his backyard. He also said that this hammock swings like a traditional garden hammock and was easily set up without much struggle for backyard camping. Another consumer who bought this collapsing hammock said that he gets all kinds of attention when he takes it to the beach and unfolds it to sunbathe. Yet another consumer stated that the hammock stand was easily set up and had no issues getting on it as long as the weight was evenly distributed. Other buyers said that they opted to do some hammock DIY, building a hammock swing with tight, corded knots. The next folding hammock was the Stalwart Hammock. Stalwart says you don't need a tree and that you can install this mobile hammock with minimal assembly or setup. Conveniently folds into the easy carry backpack. One consumer said that it was a disappointment because it broke on first use, so he bought a Pawleys Island hammock instead. Another consumer told us that it wasn’t too heavy and they were able to fold it with quickness and ease. Other buyers say they found this same hammock for more money offline in Loews, Target, Walmart and Costco. Setup and take down were a breeze and was easily transported with the carrying case. The All in One Hammock by Kijaro was another portable folding hammock with carry bag we examined. Made of 100% polyester and has a canopy that is detachable and can be rotated 180 degrees.6 beverage cooler included. A wheeled backpack carry bag is also included. The hammock also has a holder for magazines and 2 cup holders made of mesh. Once consumer who bought this Kijaro hammock stand told us her hammock's polycarbonate rods broke down within a week of installing it in their backyard. Another consumer we interviewed told us that this hammock was roomy and strong enough for 2 people to use together. Yet another consumer said this hammock is very easy to set up/take down and that the fabric was very sturdy. The fourth portable hammock we took a look at is billed as the best hammock for backyard camping. The manufacturers, Jumbl, say that this PVC-style, polyester a sling hammock is a portable option that is water resistant and can easily be toted around using its convenient shoulder harness and carry bag. Whether you were looking to set up your hammock on a beach, at a local park, on a campground and get some rest or even sunbather, the manufactures say that it is easy to assemble the steel frame and climb into the soft and forgiving polyester sling. Many buyers we spoke with were unhappy, however, saying that it is a flimsy hammock that cannot support weight, with one a buyer telling us that he fell through the polyester material straight onto his deck, hurting himself. Many buyers we interviewed reported similar problems at the end of the day recommend purchasing a different option. The last option we examined was the Fold and Go travel hammock- it has a weight capacity of 225 pounds, folds up like a chair, and even includes a storage area beneath the sling itself in the style of a mess cradle that is an ideal place to store pillows, blankets and reading material. Buyers we spoke with said that it was super-easy to fold up and that it was very stable. Other users said that the build quality is good and that it is a comfortable spot to take a nap. Particularly when you are traveling on the road in a recreational vehicle, stopping in different campgrounds across the United States, this mobile hammock provides a convenient, impromptu resting spot.